Turn the unit on using the small power button. Then use the larger button to toggle to the following settings. Once this is all set go to Speed (Checkered Flag Symbol) then toggle to the revolving speeds. Hold the big button in squarely for 3 second and that locks the buttons. I recommend putting it into an Aquapack for security and extra water proofing and then go out on the water and get some fast times. Once you have finished your session for the day turn off the unit by unlocking the buttons (3 Seconds large button) and then hold the small button down until it switches off. 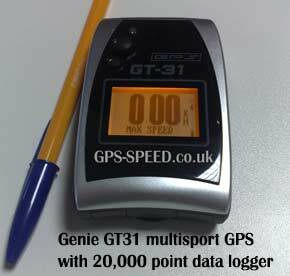 Download the latest software from www.gps-speed.com (free for 30 days then its 29 Euros to buy) and follow the instructions. 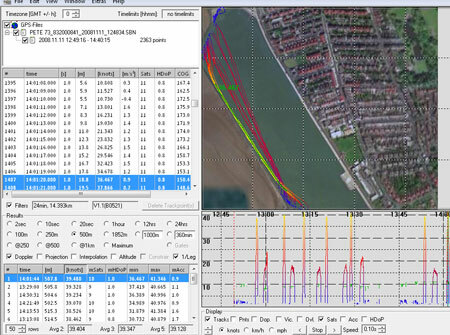 Take the memory card out of the GT31 and put it into a card reader attached to your computer ( most Laptops have them now days) and open the file on the card and then you can see the tracks you have made analysis the speeds over multiple distance times etc. if you have registered with GPS speedsurfing and put in you favorite spots equipment used etc. 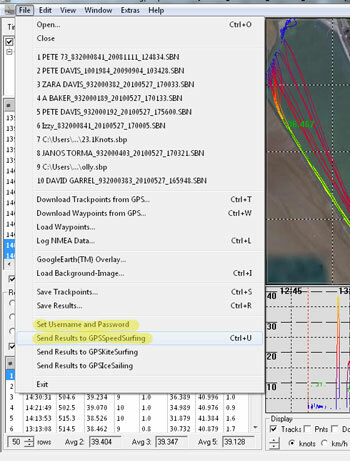 You can put in your username and password into the program and it will up load your session automatically to your sessions on GPS speedsurfing site. Sounds a lot but once its done you can upload and look at your sessions in seconds. the best thing then is you can then compare your results with your mates, local club, nationally and even internationally.